Cherish the striking views from this lovely home, high on the hillside on Park Meadow's coveted Larkspur Drive. 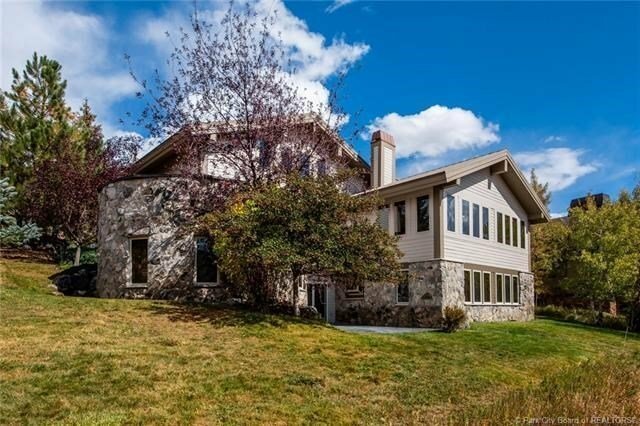 This custom residence is reminiscent of Park City's historic mining past with its enormous, hand hewn timbers and beautiful woodwork. The master is the entire top floor with an office/study. The main level has a powder room; a beautiful, open living/dining/kitchen area with incredible sunlight and a gorgeous fireplace and an adjacent exterior patio/terrace. Perfect for picnics, as well as, camp outs and star-gazing. The lower level has another great patio area; 2 bedrooms; 2 bathrooms & an indoor pool! (Could be converted to a bedroom/bonus room or remain a rockin pool for year-round enjoyment.) Fun and whimsical with abundant storage, extra parking and garage space for 3 cars. Bordering open space/trail. Easy stroll to Park Meadows Golf Club and access to Round Valley's hiking/biking/ski trails is nearby. What more could you ask for at this price!